Russia's Mars probe, Phobos-Grunt, is stuck in low-Earth orbit, dropping closer and closer to its destructive encounter with the planet's atmosphere in the next few weeks. Thanks to the talents of Ralf Vandebergh, an astrophotographer and veteran satellite spotter from the Netherlands, the troubled spacecraft has been newly imaged in something of a skywatcher's swan song. The spacecraft is expected to crash back to Earth sometime around Jan. 16. 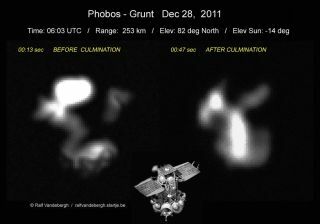 Vandebergh told SPACE.com that on Dec. 28, after a long period of cloudy weather, he finally grabbed a new picture of Phobos-Grunt as it sailed over Europe. "In the tracking scope of my instrument, a 10-inch Newtonian telescope, Phobos-Grunt showed a kind of orange color," stemming from the golden foil that surrounds the spacecraft, he said. Vandebergh had snapped images of the marooned Mars vehicle nearly a month earlier. This latest photo has better resolution, he said, thanks to a higher pass of the Russian spacecraft. Different elements of the probe can clearly be seen, such as the propulsion module, its Phobos lander and the vehicle's solar panels. Phobos-Grunt was boosted into space Nov. 8 (Nov. 9 in Moscow), but failed to accelerate on to Mars. The mission was designed to land on Phobos, one of two moons circling the Red Planet, grab specimens of the object and rocket them back to Earth in 2014. "For me as a photographer, it is amazing to capture a Mars probe," Vandebergh said. "I was very surprised how the probe would show, as there were no other images before my earlier capture on November 29. This time it was very exciting to see how the probe would look after a month and during a whole different pass." While he was pleased to capture images of the wayward probe, Vandebergh added: "Honestly, I’d prefer to see Phobos-Grunt on its way to Mars." According to Toronto, Canada-based Ted Molczan, a leader in a global network of amateur satellite watchers, Phobos-Grunt is expected to plunge through Earth’s atmosphere sometime in mid-January. "Based on orbital data issued by the U.S. Strategic Command over the five days ending December 29, and predicted space weather, I estimate that Phobos-Grunt will decay on January 16, 2012, plus or minus four days," Molczan told SPACE.com.